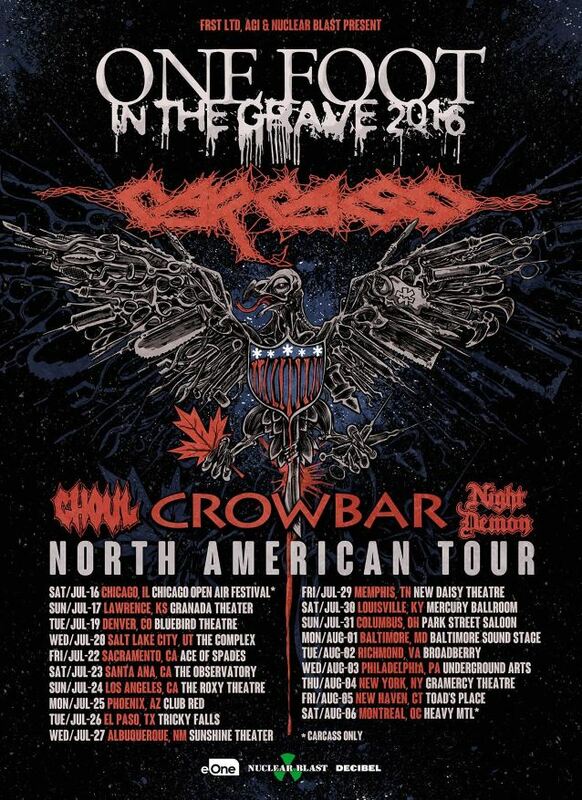 Fan-filmed video footage of CARCASS's entire July 23 performance at The Observatory in Santa Ana, California can be seen below. CARCASS guitarist Bill Steer told ResidentRockStar.com last week that fans shouldn't expect to see the follow-up to the band's "Surgical Steel" album (2013) anytime soon. He said: "Definitely not, 'cause we're still touring. It's just there was no way we could do it. I think some of us in the band really wanted to get stuck into that last year, but not everyone felt the same way, and I think in Jeff's [Walker, bass/vocals] mind, we need to be touring up until the end of this year, and then maybe we can, you know, slow down. 'Cause there's no way we can make a record while we're on the road. I mean, it's just not possible. It's not that kind of music." He continued: "It's torture for me, because I would have liked to have been working on [new music] before this [latest U.S. tour], but I'm just one person in the band. I suppose if we'd done something too quickly after the last record, it wouldn't have been taken too seriously anyway. We could have worked our asses off and done a really valid album, but because it was still in the wake of the previous one and the publicity around it, I don't think it would have done too well. So I do understand the rationale in that sense, yeah, but just as a guy in the band, it's frustrating, 'cause you wanna be creating new things, and two and half, three years down the line, if you're still just touring a similar kind of set, it can be weird on a bad day." Steer also talked about the CARCASS songwriting process and how it has evolved over the years. He said: "When we get together and do our CARCASS thing, I guess it's a very similar pool of influences we're drawing from that we were drawing from back on album No. 3, [1991's] 'Necroticism', and that's a whole spread of things. Like the very early death metal — that stuff which we still revere — and a band like SLAYER, obviously, and MERCYFUL FATE and KING DIAMOND. There's the whole New Wave Of British Heavy Metal era, which I'm a big fan of. I like a whole load of '70s hard rock, but I'm quite careful about how much of that feel I bring into the band, 'cause there's a limit to how far you can push that element. And we just do what feels right, I guess. That's how we worked on 'Surgical'; we just kind of went into the rehearsal room every day with a load of riffs and bashed things around, and if something felt good, we just ran with it." 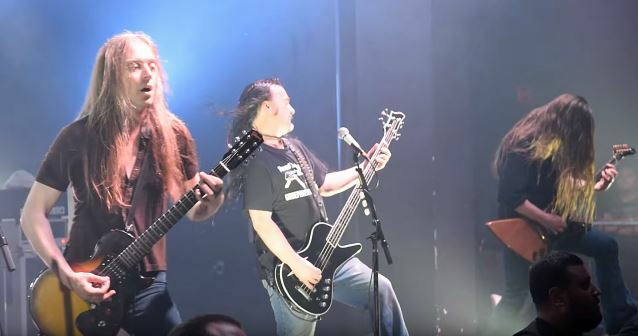 Joining Steer and Walker in CARCASS's current incarnation are drummer Daniel Wilding (ABORTED, TRIGGER THE BLOODSHED) and guitarist Ben Ash (PIG IRON, DESOLATION, LIQUEFIED SKELETON). "Surgical Steel" sold around 8,500 copies in the United States in its first week of release to debut at position No. 41 on The Billboard 200 chart.